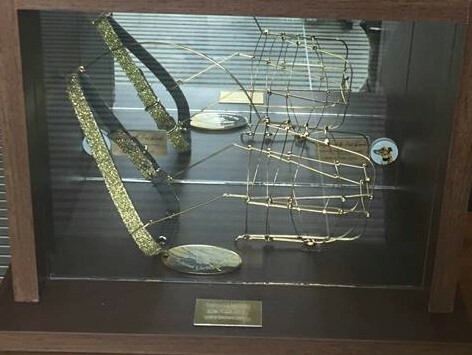 A prestigious feature event on our annual Open race calendar, the 2017 550 Yard Golden Muzzle will crown a new champion tonight on a wonderful night of final action made possible through the generous and continued sponsorship of the Greyhound & Petworld. Won last year by Skywalker Leaf, the stake carries a winner’s prize of €4000 and has provided some thrilling fare in recent seasons with a 2015 victory for track regular Ivy Hill Bart after the redoubtable Limerick favourite Ballyana Foxtrot claimed the title in 2014. The success of The Greyhound & Pet World has benefited many across the greyhound racing spectrum as Dominic, Kathleen and their team sponsor events at various venues and across all grades. Their influence on the sport is no more evident than here at Limerick tonight and their continued support is hugely appreciated and greatly valued by the greyhound racing community both in Limerick and nationwide. Topping the bill on an exciting undercard will be the final of the Peter Magnone Memorial A3 525 Yard Stake where Playmistyforme, Tyrur Minister and Marcus Aurelius will vie for favouritism after what have been closely fought and thrilling early round heats. 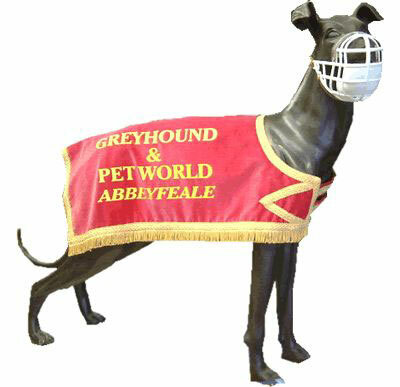 Also sponsored by the Greyhound & Petworld the event is staged in memory of Dominic’s nephew and offers an attractive €1500 for the winner. 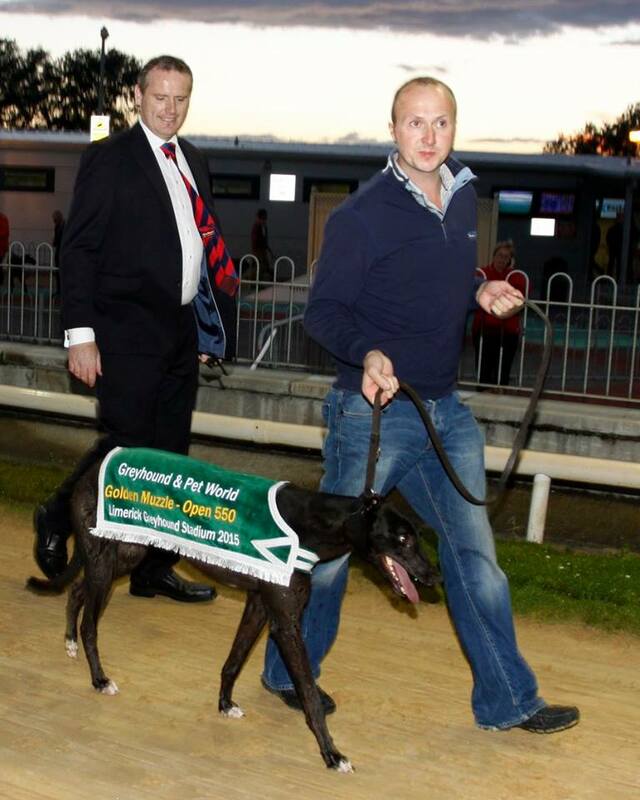 Certain to start favourite for the final of the Golden Muzzle is the Pat Guilfoyle trained Good News following his sizzling semi-final display when laying something of a Limerick ghost. Having battled through bumping to secure a qualifying third place in Round One, a first clear run in his fourth Limerick outing saw the recent Scottish Derby finalist return a sparkling twelve length victory over Cheer For Me in the competitions fastest time of 29.49! A rails draw in Trap 1 is unlikely to hinder his chances tonight and although certain to be a very short price for victory, is an obvious selection who will prove very difficult to repel if finding an adept break to defend his rails pitch. There are always dangers however and there can be value in the market for those seeking to oppose the favourite with the obvious starting point being our sole unbeaten finalist, Dream Mover. Robert Roberts strong runner has taken well to a track which ideally suits his racing style and he has displayed a remarkable battling quality in the heats thus far. 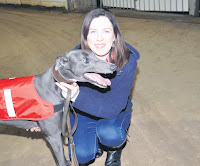 His Round One victory in 29.83 came after suffering a bump upon leaving traps before clever track craft at the bend brought a telling back-straight challenge. Breaking better in his semi-final, he appeared to have the race settled before reaching the opening bend before his attempt to turn at pace brought a drift towards the outside and a significant bump with eventual second Gulleen Billy which greatly affected both runners in a winning time of 30.04 as Dream Mover prevailed by two and a half lengths. It may appear as though there is a mountain to climb for any of his rivals to mount a serious threat to Good News in the final given the vast difference in semi-final times and while it will admittedly take a big run to cause an upset, the deficit is not as vast as it may seem at first glance. The likely scenario is that Good News breaks well, holds the inside line to the bend and completes victory thereafter but he will have to break well to ensure victory for there are plenty to rival him on the run to that first bend. On his immediate outside in Trap 2 is Lone Bullet who possesses slick early pace for the 550 yard trip and a reproduction of his smart break when gaining a Round One victory in 29.98 would serious complicate the favourite’s task while bringing last year’s winning trainer Michael O’Donovan a realistic win claim of his own. 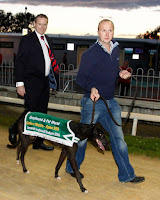 Another finalist who warrants plenty of respect is Tim Gilbourne’s local favourite Gulleen Billy who has charted a path to the final without victory but remains a huge threat to all as true Open race standard bearer at Limerick. Filling second place in both heats without clear passage, Billy is a tenacious performer and if finding his best break can significantly reduce the time differential if leading to the opening bend, dismiss him at your peril! With six inside seeds for the final, those drawn in the middle traps could consider themselves unlucky in the draw and a fast break will be essential for the chances of Black Farren or Cheer For Me. The former is an improving youngster who opened with a pleasing second to Derby champion Rural Hawaii before battling from last place to earn a qualifying position behind Dream Mover and Gulleen Billy last time but while he will certainly be doing his best work from halfway, the fear is that he may be a touch too far adrift of runners who will cede little late on. In the context of this particular race, a Trap 5 draw is far from ideal for Cheer For Me and his 2014 winning trainer James Roche. He threw himself into outright contention with a brilliant early paced display in Round One when defeating Gulleen Billy in 29.85 but while gamely negotiating his way to second place from a horror draw in Trap 6 last week, he actively sought the rails on that occasion and likely to repeat that move now, his claims for a clear run are under much threat. It’s a long standing adage in racing that often it can prove best to be drawn on the outside in a race with all inside seeds and there could definitely be merit to the old saying here. Dream Mover would undoubtedly prefer a pitch closer to the rails but he broke well from Trap 3 in Round One, even better from Trap 4 last week and a repeat could plausibly see a clear run now. Running off the bend last week when holding the inside line, he may be better coming from wider out to sweep the turn at pace and with Cheer For Me almost certain to move left, the room could be available to reach the bend in a prominent position before delivering his formidable back-straight challenge. A wonderful breeding success for Robert Roberts, he is sired by the kennels twice raced Some Sleeper with this his first litter. A talented crop, the litter also includes Urban Rock who was narrowly eliminated from our semi-final and a victory for Dream Mover would further vindicate a wonderfully successful breeding venture for the Roberts family.